The hotel is situated within walking distance from the centre of Anacapri, with its typical small streets and buildings, from the famous St. Michele Villa of Axel Munthe and from the chairlift that leads you to the wonderful viewpoint of Mount Solaro, the highest point of the island, Bellavista Hotel is also in an ideal area to easily reach all the place of the isle, the walks and the excursions trough all the area. It is also close to the public bus stops to Capri, to the port, to the Blue Grotto, to the bathing establishments of Anacapri (Blue Grotto and the lighthouse of Punta Carena) and to the beaches of Marina Piccola. Hotel Bellavista, opened from the first years of the last century, is one of the oldest Hotel in the island. The main structure of the Hotel is an old building that belongs to the XVII century when it was used as “spin tower”. 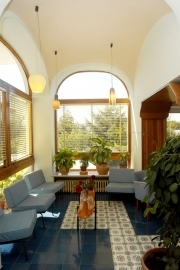 It has had, during the years, a series of consecutive interventions of restoration and requalification, but preserving all the architectural features of the ancient houses in Capri: the Hotel offers bright and large rooms, with tall ceilings with barrel or cross vaults, arches, majolica floors, large windows. Outside there are terraces, paths and colonnades covered from the classical wooden pergola of local vineyards. Our Hotel is not the newest or the smartest in the place, but as we were the first to arrive here, we chose the best position in a lonely beauty.Our house, surrounded by a cultivated garden, is located in one of the most panoramic point of the isle and it dominates all the gulf of Naples. The isles of Ischia and Procida, the gulf of Pozzuoli, the coast of Naples and Vesuvio are scenary offered to our guests. The hotel has fifteen rooms: singles, doubles, three bedded and two suites equipped with a living-room and an upper bedroom. All bedroom are attractively furnished, with balcony or terrace overlooking the sea or the garden, private bathroom or shower. They are equipped with central heating, air conditioning, direct-dial telephone, TV Sat, hair-dryer, minibar, safety-box. The rooms, the restaurant, the bar, the common enviroments, the outdoor spaces, the sporting centre are the facilities you can enyoy of Bellavista Hotel. Our Hotel is not the newest and the smartest one, and neither the largest in the isle; for this reason we can consider our clients as real guests and not like “numbers of rooms”. 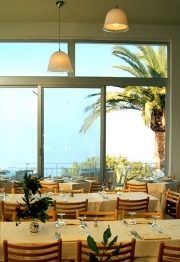 Restaurant - large room with panoramic view, 150 seats; service for guests. Typical dishes of local cuisine. Pool - Semi, the largest on the island, 50 meters at the Hotel San Michele, at special prices. Sport - three lighted fields for practice tennis, teacher for lessons in language, coach, dribbler, availability of equipment, soccer; tennis table TV sport games. Meetings - organization of meetings and conferences with transfers, accommodation, catering and leisure, with the support of the Congress Centre of Capri, the management group, the hotel is a part. For Disabled - easy access and accommodation. Laundry - by internal or external, for particularly clothes. You can reach the isle of Capri from Naples (molo Beverello or molo Mergellina), from Sorrento, from Amalfi coast by public transportations: ships, hydrofoils and fast jet or “more autonomously” by taxi of the sea and helicopter. From early in the morning until late in the evening, especially during summer season, just short breaks space out the docking at the harbour of Marina Grande. From Marina Grande you can reach us by taxi in 12 minutes, by bus in 20 min., or by cablecar to Capri and then by bus to Anacapri. The nearest bus stop is 20 metres far from the Hotel. From March to October you can’t land to Capri by private cars, if you aren’t a local citizens or foreign guest. Garages and guarded parking for the whole day are available in Napoli and Sorrento port.